We read the two books, Bugs Galore and Some Bugs. Then we brainstormed a list of words to describe bugs. Students voted on their favorites and we added them to the poem, Bugs, Bugs, Bugs! complete with students' illustrations. Thanks to fellow librarian, Erin Wasko for the idea! After reading the book, The Gingerbread Man Loose at the Zoo, the 2nd graders wrote their own riddle about the animal they were researching in class. Students had to think about how their animal looked, what it ate, how it moved, and an interesting characteristic. After they wrote the riddles, I read the riddles to another 2nd grade class for them to guess. Here is one example from Ms. Christon's Class. For Poetry Month, the 3rd grade students created Silly Self Portrait Poems. We read the books, My Best Friend is as Sharp as a Pencil and My Dog is as Smelly as Dirty Socks by Hannoch Piven. Both books are filled with similes! Then we wrote similes about ourselves for our poems. After writing, we recorded our poems in the Chatterkid App. Here are the videos by class. 3rd Graders work on a Roller Coaster Challenge--The library was home to 4 tube rollercoasters. Each team had to create a roller coaster with 3 hills and one loop. Teams completed the challenge! In the 3rd Grade Reader's Theater group, we made video presentations of two classic stories. Students constructed and raced Lego cars in our 2nd grade group! We gave everyone a chance to go back and modify their designs. Engineering Design Process at work! 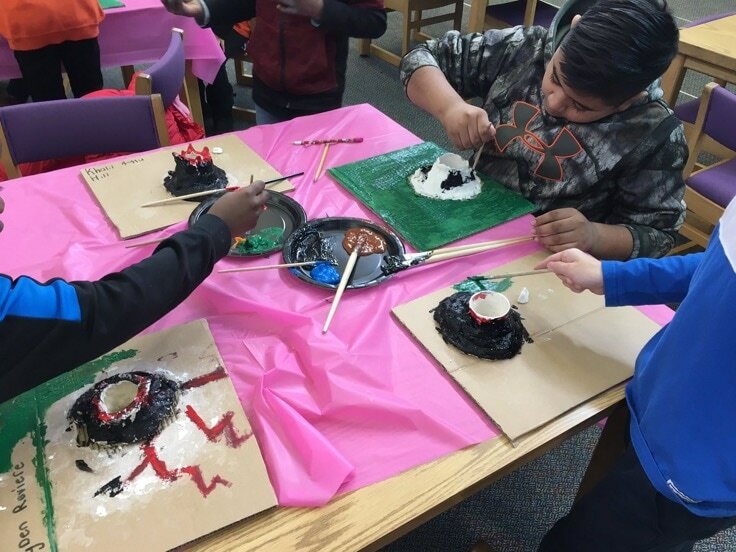 December 2016: Making Volcanoes! We made the play dough, then waited about a month for it to dry! Finally, able to paint and then it is time for the eruptions with baking soda and vinegar.